When most people think about fast food, they probably think of the traditional burger joints that are associated with North America.How much do you really know about fast food in Canada and America though? What else is there in the states and the Canadian territories that isn’t illuminated with a giant Golden Arch? Although we all know about the major players, there are many smaller fast food joints in America and Canada, some of which have crossed over to the UK and others which remain peculiarly American and often on a smaller scale. Some of the fast food operators in America, for example, have regional roots; one of these is as White Castle in the Midwest United States. Widely believed to be the first ever fast food chain, White Castle as well as fast food in general has become an American institution. A Rolling Stone magazine article in 1998 reported that a 96 per cent of American schoolchildren surveyed could identify Ronald McDonald, and the only person with more ‘brand recognition’ was Santa Claus! It was also claimed that the famous Golden Arches were more widely recognized than the Christian cross. 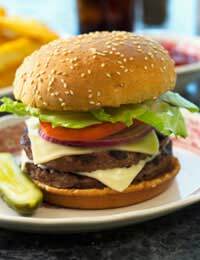 Burgers are quintessential American style fast food. The first Wendy's Old Fashioned Hamburgers restaurant opened in 1969 in Columbus, Ohio, and they pride themselves on quality over quantity, promising that every single one of their hamburgers is made-to-order. Wendy's is third in behind Burger King and McDonald's when it comes to sheer size, but still has over 6,500 locations worldwide. Burger King is the number two burger joint. Started in Miami, in 1954, they are best known for the Whopper which has been in production since 1957. All Burger King burgers are flame grilled which is supposed to give the meat a home grilled taste. Of course, the top fast food in the States is the same as everywhere else – McDonald’s has that claim to fame. The Big Mac is apparently the most popular fast-food item on Earth, made from two beef patties, special sauce, lettuce, cheese, pickles, onion and all on a sesame seed bun. McDonald’s sells an amazing 560 million Big Macs each year! Subway, the bespoke ‘choose-what-you-like’ sandwich store is a big American phenomenon - the chain actually started out in 1965 and has grown from a single shop in America to more than 30,000 franchises in 88 countries around the world. Subway is now the largest sandwich chain in the world and operates more stores in the United States, Canada and Australia than McDonald's does. Another one that you might not have heard about is Arby's Roast Beef Restaurants - the first one of these was opened in Boardman, Ohio. The chain does what you’d expect, serving its roast beef sandwich to happy customers in more than 3500 restaurants in the US and Canada. Not anything like the authentic pasta and pizza that you would get in Italy, the Pizza hut version is another successful American fast food export, with almost 15,000 franchises in the USA alone. The first Pizza Hut was opened on campus at Wichita State University in 1958, and has grown into the number one seller of pizzas in the United States. Fried Chicken – Finger Lickin’ Good? Fried chicken is one of the staple foods of the Southern United States, and it was a great idea to mass market this soul food to a wider fast food loving audience. In 1930, Harland Sanders opened his fried chicken restaurant in the front room of a gas station in Corbin, Kentucky. People liked the taste so much that the one restaurant expanded, became Kentucky Fried Chicken and is now the most popular fast food chicken restaurant in the world. In 2008, KFC operated more than11,000 globally, and according to statistics the company sold more than one billion chicken dinners in 2006. KFC's is now part of a bigger food chain (as if it needed to be) with other fast food chains including Pizza Hut and Taco Bell. Taco Bell is the number one Mexican fast food restaurant chain in America, with branches in other counties too. The chain was founded in California in 1962, with the signature tacos being the most popular menu option, along with Mexican classics like burritos, quesadillas, and nachos. In Canada most of the fast food chains are American owned, although some are now more popular in Canada than in the United States, and but are more prominent in some of the US border states like Michigan. Tim Horton's, the coffee and doughnut supremo are gaining popularity and now expanding beyond North America. The Canadian Extreme Pita franchise sells healthy pita sandwiches with less salt and fat – and you can find these in some of the larger Canadian cities. Other Canadian fast food chains like Manchu Wok serve Asian foods in a North American style, and Canada has it’s very own burger chain too, called Harvey’s.